At Tec Container Asia Pacific, we have one Ramshorn hook attachment (BA-110CF2) for reachstacker available here in Australia. When attached to a reachstacker, this hook attachment transforms any spreader into a multipurpose transporter with a lower hook for general cargo. It is suitable for every container terminal/yard, logistics warehouse and container services provider thanks to its versatile usability. All TEC Products include a “Declaration of Conformity” that is in compliance with Machinery Directive 2006/42/EC. EC Plate with a unique serial number of construction and traceability of materials. Please email our team for more information pack. 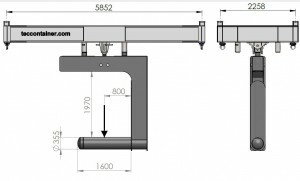 We have one coil handler attachment for reachstacker available in stock. 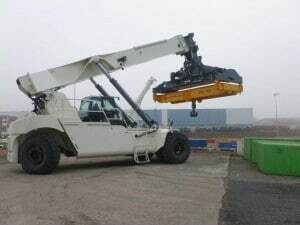 This coil steel handling attachment transforms a container-handling reachstacker into a coil steel handler in a second. 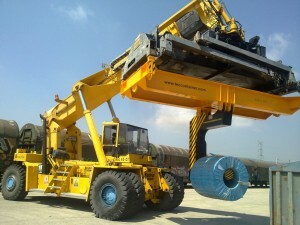 It is an ideal choice for being attached to a reachstacker for handling steel coils. 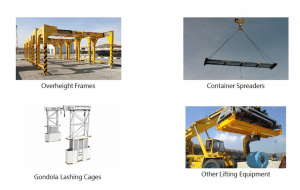 TEC Container Asia Pacific Pty Ltd is the agent and authorised distributor of TEC Container SA within Australia, New Zealand and the Asia Pacific region.